Honda float reunites Japan tsunami survivors with U.S. military first responders. Rendering of Honda’s float in the 2015 Rose Parade. 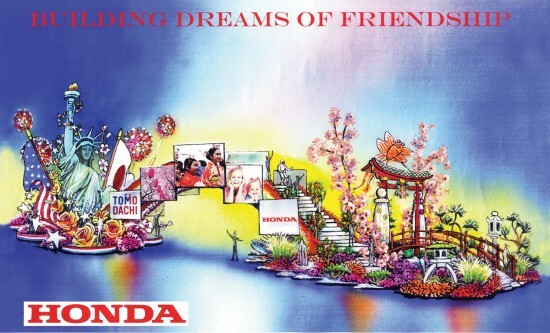 PASADENA — Honda’s 2015 Rose Parade float entry, “Building Dreams of Friendship,” will lead the 126th Rose Parade presented by Honda. The float celebrates the friendship shared by the U.S. and Japan through the Tomodachi Initiative, and pays tribute to the resilience of the people of Tohoku (northwestern Japan). The float also seeks to highlight the ongoing reconstruction effort in the regions affected by the Great East Japan Earthquake and tsunami of 2011, and pays tribute to the role played by the U.S. military in the humanitarian response. Themed “Inspiring Stories,” the Rose Parade will take place Thursday, Jan. 1, 2015. Born out of the relief effort following the Great East Japan Earthquake and tsunami, the Tomodachi (Friend) Initiative was created by the U.S. and Japan to strengthen the bonds of friendship and leadership for future generations of Japanese and American youth. As part of this initiative, Honda will bring 20 high school students from Tohoku, the region most impacted by the 2011 disaster, to participate in the Rose Parade with Honda’s float and perform a special song composed for the parade by six-time Grammy Award winner Daniel Ho. While in the U.S. for two weeks, the students will participate in several cultural activities and programs. The students will perform at the Japanese American National Museum and other cultural centers, participate in a project with Honda Associates to assemble disaster relief kits for the American Red Cross, conduct a homestay visit with Honda Associate families and community members, and meet with a group of their peers at a high school in Torrance. The Tohoku students, many of whom were directly impacted by the twin disasters, will be joined on the float by several additional special guests, including representatives from four branches of the U.S. military who were among the first to arrive in the region to provide humanitarian aid and support. Honda’s 2015 Rose Parade float symbolically joins Japan and the U.S. in friendship and unity. Each section includes iconic imagery, including the Statue of Liberty and a torii, or traditional Japanese gate, and the flags of the two nations. Each side is highlighted by flowers emblematic of the two nations, such as the rose, the national flower of the U.S., and the sakura, or cherry blossom, of Japan. The cherry blossom represented on the float is the kokunodate variety of Tohoku, and is one of many regional elements represented. Other touches include Tohoku cherries, rice ready for harvest, Tanabata Festival decorations, and a tuna, which represents the importance of fishing to the Tohoku community. All of the regional elements featured on the float were suggested by the students. To symbolize the bond between the two nations, two sections of the float are joined by a bridge adorned with 10 video screens broadcasting messages to the crowd along the parade route. Elements of the float will be decorated by the students in the days leading up to the parade. For the fifth straight year, Honda’s float will be propelled by a specially configured hybrid, low-emission engine designed to help it function more efficiently. The tournament’s theme banner float will also be Honda-powered. 2015 marks the 54th year Honda has collaborated with the Tournament of Roses and its fifth year as presenting sponsor. The all-new 2015 Acura TLX sports sedan will be the parade’s official pace car, and the redesigned 2015 Honda CR-V will serve as the sound car. In an expansion of Honda’s relationship with the Tournament of Roses, the company will partner with the tournament on the parade’s opening show for the first time. Honda first collaborated with the Tournament of Roses in 1961 to provide two-wheeled vehicles for 1962 parade operations. Honda has been a float participant in the parade since 1977, and has provided the official Tournament of Roses vehicle since 1994. Honda continues to supply two-wheeled vehicles and also provides side-by-side (multi-utility) vehicles for parade operations. As presenting sponsor, the Honda float is the first in the parade and showcases the theme. As a result, it will not be considered a commercial entry and will not compete during the judging process Prior to becoming presenting sponsor in 2011, Honda floats won awards in 15 of the previous 16 years. Honda established its U.S. sales and marketing subsidiary in 1959 and currently produces automobiles, all-terrain vehicles, lawn mowers, jets and engines at its 16 major U.S. manufacturing operations, using domestic and globally sourced parts. Honda has long recognized that success isn’t measured solely by the products it makes, but also by the lives it enhances. Honda is committed to developing products and technologies that make people’s lives better, and to developing long-lasting relationships with community partners. From its extensive support for STEM education and Historically Black Colleges and Universities, to its associates’ volunteer efforts on behalf of pediatric brain tumor research and environmental clean-up activities, Honda believes in giving back to the communities in which its employees live and work. Find out more at http://csr.honda.com. The Pasadena Tournament of Roses is a volunteer organization that annually hosts the Rose Parade, the Rose Bowl Game and a variety of associated events. The tournament’s 935 volunteer members act as ambassadors of the organization within the community and serve on one of 31 committees that ensure the success of the parade and game. Collectively, they contribute upwards of 80,000 hours of manpower each year. The 126th Rose Parade will be followed by the College Football Playoff Semifinal at the Rose Bowl Game presented by Northwestern Mutual. For additional information on the Tournament of Roses, visit the official website at www.tournamentofroses.com.